While boutique hotels comprised just 3.2 percent of the total U.S. lodging supply in 2017, boutique projects represented 17.8 percent of the rooms in the development pipeline as of June 2018. Boutique hotels are popular with developers for a variety of reasons. Using these six categories, CBRE publishes quarterly forecast reports that present three-year projections of occupancy, average daily rate (ADR) and RevPAR. Further, once a year the report provides revenue, expense, and profit metrics that allow boutique owners and operators to benchmark the financial performance of their hotels. 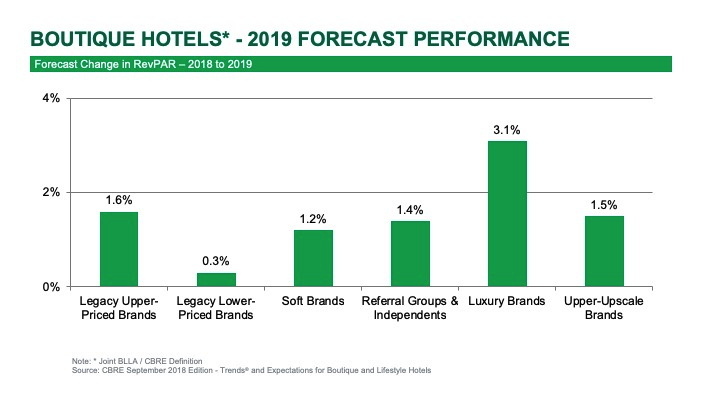 As the budgets for 2019 performance are being finalized, we present the latest forecast and financial benchmarks from the September 2018 edition of Trends® and Expectations for Boutique and Lifestyle Hotels. In 2017, the 1,281 properties in the U.S. designated by BLLA and CBRE as boutique and lifestyle hotels achieved an aggregated occupancy of 70.5 percent, and an ADR of $208.52. This represents a 6.9 percent occupancy premium, and a 64.7 percent ADR premium, compared to the performance of the overall U.S. lodging industry for the year. During 2017, hotels in the Boutique-Lifestyle Brands/Upper-Upscale category achieved the greatest occupancy level (79.6%), while the boutique properties that are either non-branded, or members of a referral group earned the highest ADR ($253.14). Through June of 2018, the boutique segment appears to be maintaining its premium performance levels. Through the first six months of the year, RevPAR levels are up nearly 5.0 percent from the first half of 2017. Leading the RevPAR gains are the boutique properties in the Legacy Brands/Lower-Priced and Boutique-Lifestyle Brands/Luxury segments. Looking towards 2019, all six categories are once again forecast to achieve gains in RevPAR. 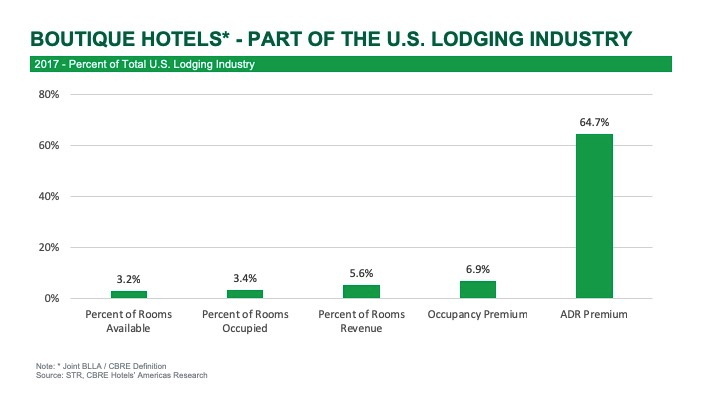 However, like the U.S. lodging industry as a whole, the pace of RevPAR growth will slow down. Boutique-Lifestyle Brands/Luxury properties are projected to enjoy a RevPAR gain of 3.1 percent in 2019. RevPAR growth for the remaining five categories is expected to be less than 2.0 percent. Because of the comparatively high levels of personal service and food and beverage offerings, boutique hotels do achieve relatively low profit margins compared to industry-wide benchmarks. 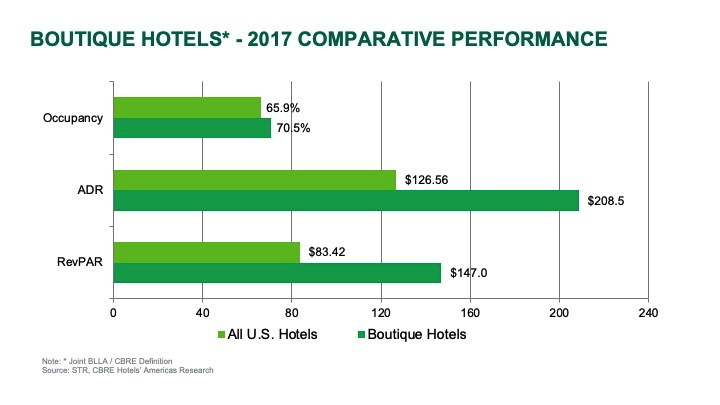 Using data from CBREs Trends® in the Hotel Industry survey, properties that meet the BLLA/CBRE definition of a boutique hotel achieved an average gross operating profit (GOP) margin of 33.8 percent in 2017. This is less than the 38.3 percent average for all hotels in the Trends® sample. The impact of the higher levels of labor and food and beverage can be seen in the total operated departmental expense ratios. On average, the boutique hotels in the Trends® sample averaged a total departmental expense ratio of 41.0 percent of total operating revenue. This is greater than the 37.5 percent average for the entire Trends® sample. Conversely, the average undistributed department expense ratio for boutique hotels (25.2%) is just slightly above the overall sample average of 24.3 percent. As would be expected, GOP margins for boutique hotels are clearly influenced by the offering of food and beverage. Boutique hotels that have restaurants and lounges achieved a GOP margin of 33.3 percent in 2017. Concurrently, boutique properties that do not offer food and beverage service averaged 47.1 percent. When analyzing GOP margins across the six competitive classification categories, we find an inverse correlation between the ratio of food and beverage revenue to total revenue, and the GOP margin. Robert Mandelbaum is the Director of Research Information Services for CBRE Hotels Americas Research. 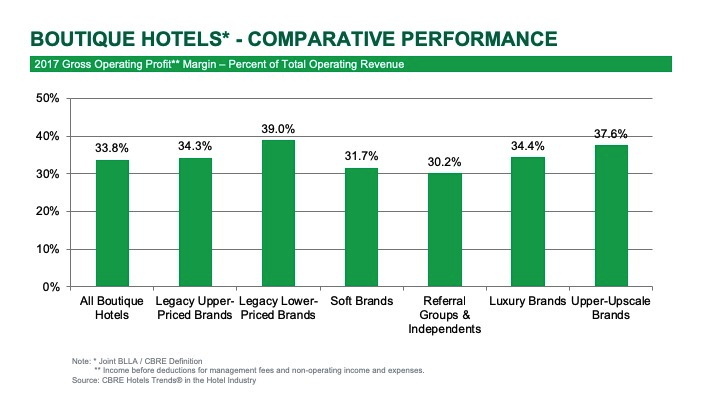 To forecast and benchmark the performance of your boutique hotel (existing or proposed) please visit https://pip.cbrehotels.com/store, or call (855) 223-1200.